When I was growing up my mom used to take me to this little Mexican restaurant down the road from us that made the best guacamole. At first, I was hesitant to try it. I was at the fun age where all I ever wanted to eat were chicken fingers and fries. My mom was always trying to get me to try new things. "If you don't like it, you can spit it out in your napkin,'' she would say. One summer evening, we went out for dinner and she insisted i try the guacamole. From that moment on I was hooked. I wanted it on everything. Fast forward 10 years, and I found myself working at Chipotle while attending college. I started as a cashier and then became a shift supervisor. I would get there early and start prepping for the day. Making guacamole day after day, batch after batch, I eventually considered myself a guacamole expert. At Cantina, we make our guacamole fresh to order, right next to your table. You control the texture and how spicy you want it. It's one of those fine touches that I think, makes us unique. We start with ripe Hass avocados, freshly squeezed lime juice, diced Serrano chiles, house made pico de gallo, and a little bit of salt. A simple recipe that is full of flavor. Couple that with our fresh homemade chips, and its a recipe for success. 1. Use Ripe Avocados—Any respectable guacamole has ripe avocados. A ripe avocado will give slightly when you press it gently and its skin will turn deep purple to black as it ripens. Most avocados that you buy in the supermarket, at least the ones near me, tend to be rock solid. You can place avocados in a brown paper bag with a banana to speed up the process. I would suggest a little advanced planning. 2. Use Fresh Cilantro and Limes—Fresh cilantro and lime juice are to guacamole are essential. We use fresh lime juice because the flavor is much brighter than bottled. Our pico has fresh cilantro in it as well. 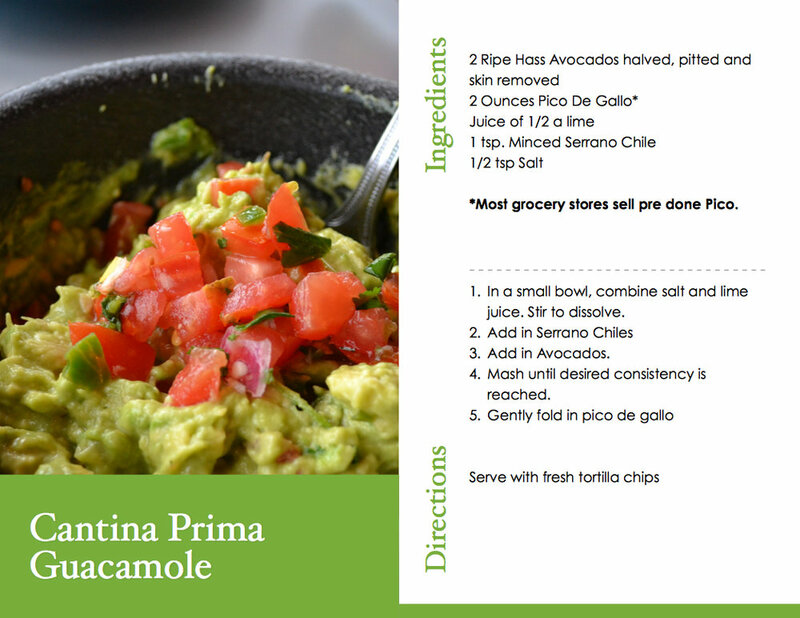 You can use store bought pico if you are in a hurry or just don’t want to do all that chopping. *Bonus: Fresh lime juice slows down the oxidation process (preventing your guacamole from turning brown). 3) Be Bold-- Guacamole is fun snack and always a hit at parties. Feel free to make changes and play around with it. Some great additions to guacamole that I have done are: Roasted Corn and Goat Cheese, jicama, pineapple and little bit of habanero, and bacon and queso fresco. 4) *Pro Tip* Have some leftover guac that you want to save (like there is such a thing, like leftover wine), put a thin layer of water on top. Oxygen can’t get through and turn your guac brown. When you’re ready to finish it off, pour the water out of the container and give it a little stir. Perfecto!